Pedro Dennis of Philip, South Dakota, died June 30 as a result of a farm accident. But the community reaction to his death indicated his influence extended beyond 18 years of life in a small town in western South Dakota. The Haakon Jackson County 4-H rodeo was blanketed in red in memory of former 4-H South Dakota champion bull rider. A sign at the Ft. Pierre Fourth of July parade pronounced "In loving memory of Pedro Dennis. Fly High, Partner." A classmate and rodeo teammate, Sage Gabriel, is wearing Pedro's favorite shirt—purchased at the Junior High Rodeo Association National Finals in eighth grade—at the National High School Rodeo Finals next week. A sign inscribed "Riding for Pedro" was on prominent display and signed by the South Dakota Junior High Association team at the finals. 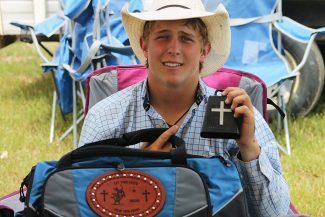 The cowboys and crown–many who had never met the young man–stood with hats in hand to remember a life ended too soon at the Black Hills Round-Up in Belle Fourche. 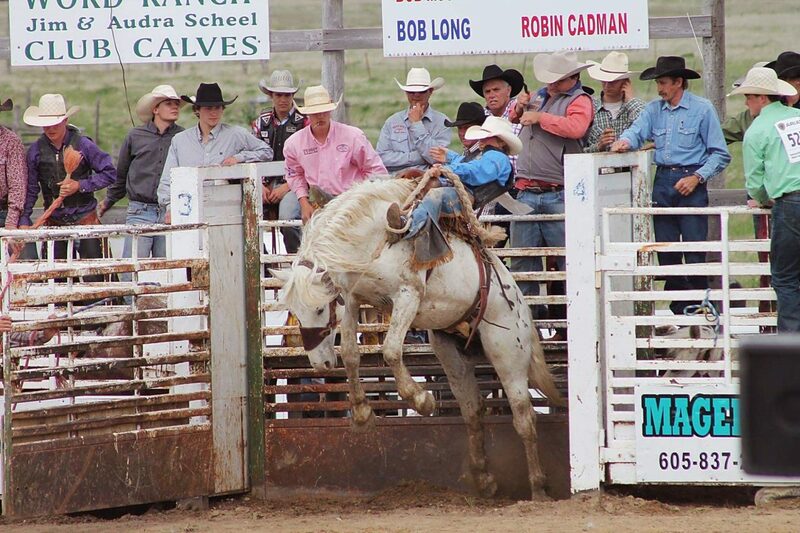 The "roughie" had one more year of high school and favored football, saddle bronc- and bull-riding. He was well-liked by everyone and made friends wherever he went, his mom Nicole Dennis said. Pedro was laid to rest July 6 with his closest friends as pall bearers. The service took place at one of his favorite places, the Philip High School football field. Named for his great-grandfather on his dad Lee's side—an odd name for a blue-eyed, blond-haired Basque little boy, his mom said, but it fit him—Pedro got his start wrestling at age 4 and riding bucking horses at age 6 with his debut aboard a pony at the inaugural Philip Bronc Match. He won. 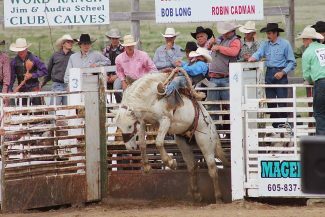 His love of sports evolved to include bull riding and football. "Our friends would say he had a God-given gift for things," Pedro's mom said. "Sports came easy for him; he had the nickname 'Lightning' for a reason. He was so quick on his feet. He loved football and rodeo, they were his absolute favorite sports." Joe Carley, Pedro's wrestling coach from preschool years all the way through high school, tries to maintain a mentor attitude when coaching; something, he said, was nearly impossible with Pedro. "When I was the coach, I was the coach; I never tried to be buddies, but he was one of those kids who attracted you," Carley said. "He had a contagious smile and always made time for everybody who was around him; it didn't matter if it was an old person, someone his age, or a young kid, he just drew you to him." In addition to winning state 4-H bull riding title in 2014, one of his more-treasured wins was the Dallas Heninger Memorial Bull Riding. The bull riding is hosted annually in memory of the young man who died at 17-years-old, six years ago, after a brief battle with Ewing's Sarcoma. "That buckle was kind of special to him," Nicole said. "Pedro wrestled with Luke, Dallas' cousin." While still in junior high, Pedro won a buckle at Faith Stock Show in steer saddle bronc riding. That buckle was a prized possession and a favorite of his to wear. Pedro primarily worked this summer and hit a few regional rodeos, but didn't qualify for state. He instead, cheered on his best friends Dylan Schofield, Dawson Reedy, and Cash Wilson—three of Nicole's extra children, as she calls them—as they vied for state titles. "Most of Pedro's friends are like more kids to Lee and I," she said. "He always said I loved my extra kids more than I loved him, and that wasn't true. They've been spending a lot of time at the house. They've been taking it hard, the whole community has." One of Pedro's favorite pastimes was hosting poker night in the pit, the name assigned the Dennis' basement after Pedro and his friends cleaned it out one day. He made a friend wherever there was an opportunity to meet someone new. "There are a couple people who said they just met him a couple weeks ago, and they felt like they had built quite the friendship with him," Nicole said. "He was just an easy-going kind of kid." He was part of a class of 20-something students at Philip High School. He and his younger brother Victor ran in the same circles with many of the same friends who "have been rallying around him and keeping him preoccupied," Nicole said. "Pedro's class was a very tight-knit class. They're taking it pretty hard." Billy Joel's Only the Good Die Young has been swirling in Nicole's head these last few weeks. "My faith and friends and family have been a rock," she said. "It's probably going to hit harder at home next month, that first football practice, the first day of school."